IS A VERY SPECIAL PLACE! You can search the entire U.S. and simply won't find accommodation in a more spectacular setting — stay with us and see for yourself! DON'T STRESS ABOUT PRESENTS THIS YEAR! romance, adventure, and relaxation all in one neat package. to a stay at Casitas de Gila. Give us a call to purchase a Gift Certificate. There's Lots To Do in the Silver City area! Read about it here. 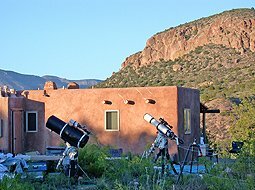 Casitas de Gila  Little Houses of Gila  is a cluster of five cozy southwestern adobe-style guesthouses, four miles outside of the tiny community of Gila (HEE-la) in Southwestern New Mexico, not too far from Silver City. Nestled among juniper and piñon pines, on an ancient river terrace overlooking Bear Creek, our Casitas occupy lands that were once favorite hunting grounds of Apaches only 140 years ago. At Casitas de Gila a diversity of birds, animals, plants, and landscape will greet you every time you step outdoors. Early risers enjoying a morning cup of coffee on their portal may watch and hear quail, scrub jays, cardinals, or hummingbirds in the pines around the Casitas or catch a glimpse of the mule deer and bighorn sheep that are frequent visitors to the cliffs above Bear Creek, across from the Casitas. a gentle morning breeze rustling the piñon pine and the murmur of the creek flowing softly among the rocks a hundred feet below. What an incredible feeling when you realize that it's so quiet here, you can hear each individual flap of a raven's wings as it arcs gracefully overhead. As you look out to the north over the cottonwoods and sycamores in the canyon below, the rising sun illuminates the yellow-, red- and white-banded front range of the volcanic Pinos Altos mountains in the Gila Wilderness, beckoning you for a day's hike or an auto tour of the Gila National Forest. A bit further to the northwest, Mogollon Baldy, one of the highest peaks in the towering Mogollon Range, gleams an 11,000 foot invitation from its home in the magnificent Gila Wilderness. Of course, you don't have to rush off to do things while you are staying at Casitas de Gila, despite the incredible attractions of the surrounding area. 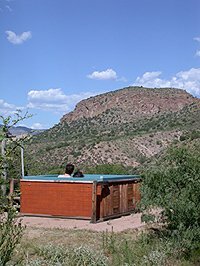 The hot tub perched on the edge of the cliff above the creek makes a wonderful, ringside blind for watching birds and animals. We have the best New Mexico birding right here on our property! 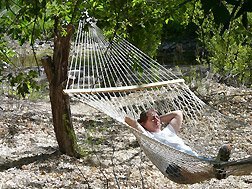 When the sun begins to warm you, you can move your "activity" down to our hammock, in the shade of the willows and cottonwoods bordering the creek, for a peaceful nap or quiet nature observation. By late morning, you may be ready to spend time exploring some of our 265 acres, including 12 marked trails, totaling over 7 miles of hiking and walking trails and paths (download our Trail Map!) 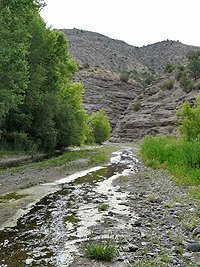 It's an easy walk down along the creek bottom, past the wonderful cliffs of Gila Conglomerate. Our newest trail, the Cliffside Loop Trail, has a spot that's just perfect for quiet contemplation. For a more strenuous hike, try our Paradise Overlook Trail with its fantastic views. After your hike, grab a book from your Casita and spend a few peaceful hours reading in the courtyard surrounding our Art Gallery. If you're feeling more adventurous, take a horseback ride and see and experience the beautiful vistas of the Mogollon Mountains, canyon riding, river crossings, and wildlife. Trail rides from two hours to all day are available from Wolfhorse Outfitters with advance reservations. 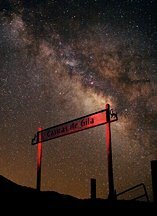 Evening is a very special time at Casitas de Gila. After a full day's activities, you'll be ready to fire up the barbecue grill outside your door and cook up your evening meal. While you're tending the grill, you'll notice that the mountains and cliffs across the creek are gradually turning from yellow, to orange, to fiery red in the light of the setting sun, eventually surrounding you in the soft, warm glow of their reflected light. Then, ever so slowly, as the shadows deepen further, a canopy of brilliant stars will magically emerge from the clear, southwestern New Mexico sky, in a spectacular display rarely seen in today's all-too-lit-up world. Using the Casitas' star charts and spotting scope, you should easily find your heavenly favorites, and probably find some new ones as well. On clear, dark nights (and when our schedule allows), Michael offers tours of the heavens through our 10-inch Orion dobsonian reflector telescope. Guests are also welcome to bring their own telescope and astronomy equipment if they have some. One of our guests told us we had the darkest skies he'd ever experienced at mag 7.3+. Visit our Astronomy & Stargazing page for more information. From the hot tub you can watch the moon glide above Turtle Rock across the creek and listen to the owls softly hooting in the dark recesses of creekbed below. As the night air cools, you can move inside and settle down beside a cozy winter-time fire in your kiva fireplace, with one of the interesting books from your private Casita library. Or enjoy a summer-time fire in the chimenea outside your Casita and study the Milky Way. Eventually, though, it's time to retire. 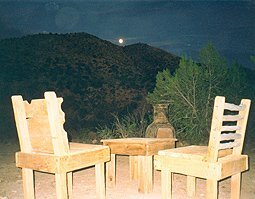 As you sink down into your comfy bed, you'll drift off to sleep with the sound of a soft breeze rustling the piñon pines, the low hoot of an owl blending with the murmuring of the creek, and the distant call of coyote howling at the moon. We enjoy talking with you and can easily answer your questions!